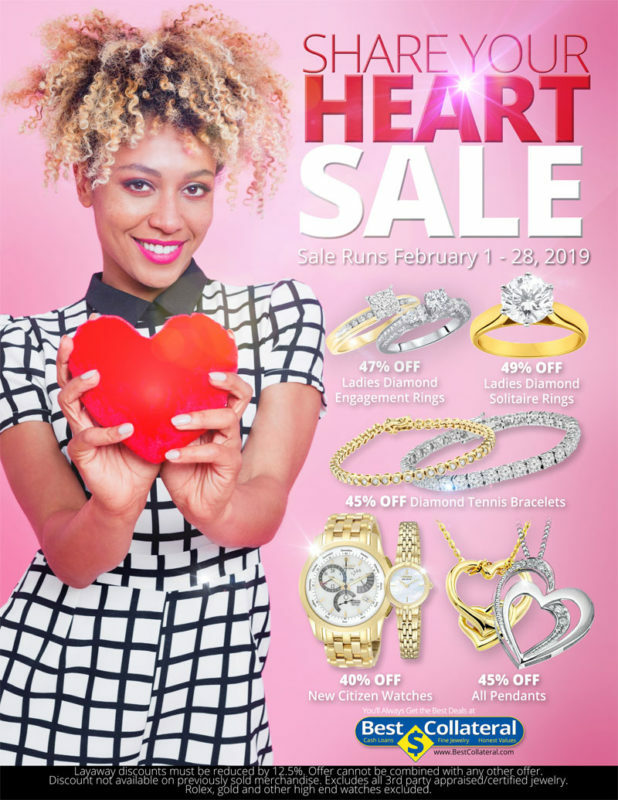 Share your heart sale, runs Feb 1 – 28, 2019. 47% OFF Ladies Diamond Engagement Rings, 49% OFF Ladies Diamond Solitaire Rings, 45% OFF Diamond Tennis Bracelets, 40% OFF New Citizen Watches, 45% OFF All Pendants, Visit www.BestCollateral.com, Layaway discounts must be reduced by 12.5%. Offer cannot be combined with any other offer. Discount not available previously sold merchandise. Excluding all 3rd party appraised/jewelry. Rolex, gold and other high end watches excluded.